1) In the first phase only some sparse devices, like calculators and desktop computers are first connected. This is the phase of connecting and exchanging information. 2) In the second phase the mobile computers are added: laptops, notebooks and palmtops enlarge the typology of the connected devices, while the wireless networks are added to the cable networks, allowing to exchange information in mobility. This is the phase of connecting and exchanging information in mobility. 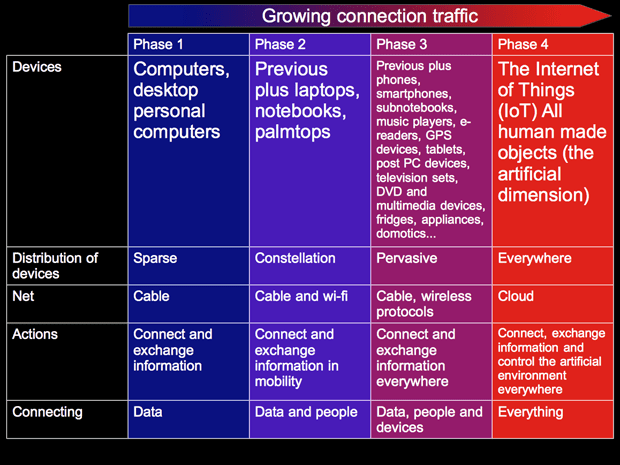 3) In the third phase, that is the present one, the networks expand to include the mobile connections and many more devices are added: phones and smartphones (the market of the smartphones is growing at a very high pace), then subnotebooks, music players, e-readers, GPS devices, tablets, post PC devices, and some appliances like television sets, DVD and multimedia devices, fridges, while domotics is progressively on the way… This process will accelerate, involving more and more devices that will be more and more interconnected. The net is becoming the cloud, with the data and calculations that will be no more stored inside precise devices but will be distributed over a dispersed architecture. 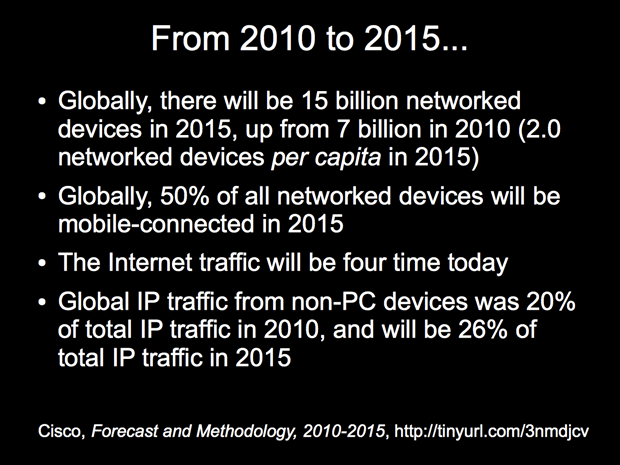 In a survey by Cisco dated June 2011, between 2010 and 2015 the internet devices will have doubled the world population and the Internet traffic will be four times today’s one, while 50% of all networked devices will be mobile-connected in 2015. This is the phase of connecting and exchanging information everywhere. 4) In the fourth phase, which is the phase of the Internet of Things (IoT), all the objects will be able to exchange information and to adapt to the environmental situations. With the IoT all the artificial dimension – that more and more pervasive and extended material dimension created by the humankind that we could call the Second Nature – will be interconnected. This is the phase of connecting and exchanging information and of controlling the artificial environment everywhere. This graph is a work in progress so it could likely contain other rows, but by now I think it is representative enough. This process will not stop with the IoT but it will go beyond, of course… The activity of trying to check, control, monitor and manage the environment is totally natural and typical of the animal species, hence of the humans too, and this will lead also to the interconnection of the natural environment. The “Artificial” and “Natural” environments will be pervaded by connections and data flows, and they will be in touch and will interoperate in a much more intimate way than what it is happening now. There are already many applications which go this direction: for instance the systems for monitoring the earthquakes, the weather, the vulcans, the climate change, the animal’s migrations, the extinction of the species… Hence it is possible to define a fifth phase, where the monitoring and the control of the natural environment will become more pervasive, sophisticated and refined. In this phase we’ll see the collaboration and the merge of digital, optical, bio and nano technologies. Our chairs suggested us to focus on the users’ side, considering the users as subjects able to modify and even to create their tools in order to communicate, collaborate and share resources. 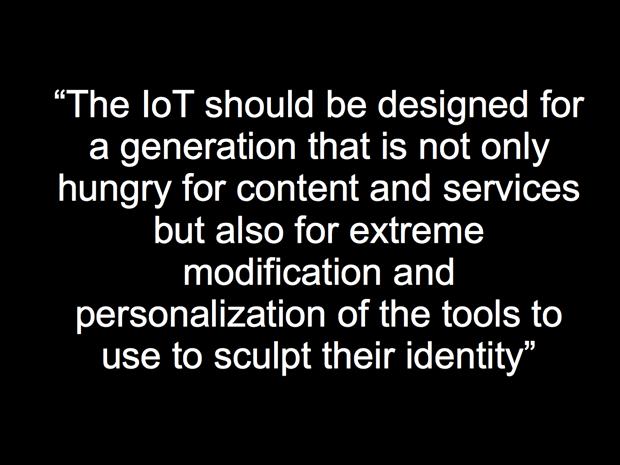 The introduction note that we received reports that “the IoT should be designed for a generation that is not only hungry for content and services but also for extreme modification and personalization of the tools to use to sculpt their identity”. I agree with this statement, anyway it raises some considerations. 1) I call KISS the first one: KISS as Keep It (Surprisingly) Simple. This sometimes escapes the goals of the Open World, which sometimes seems more targeted to refer to itself than to the “common” users, like me, by far maybe the widest majority of the people who use the tools and the devices but do not build or program them. The interfaces and the requirements for modifying these tools and devices will be used by – should be addressed to – a huge majority of people who are NOT skilled. They simply want to perform tasks and reach goals and they often are not really interested in how and why everything works. Building bridges that are simple to cross, lowering the threshold that separates the users from the information, means enlarging the base and the number of the participating users. It is not only a bare matter of access and numbers but it is a democracy related affair, since difficulties create exclusions and elites. 2) Yes, the open IoT should be user-centred, but how much should the user work? The user should be free to receive as well as to refuse the information, it should be free to interact or not. The user should be at the centre of this system and not at the end. This means that there should be a user-driven system for filtering the information, as well as a system, based on the user’s decisions, for including and/or excluding the objects, the tools and the data from the user’s events horizon. The ideal user that often emerges from the discussions and the papers appears as continuously and untiredly working and interacting, as a responding joyful machine, always ready to receive and act under the pressure of any stimuli from the machines and the objects. But users are not what this model depicts. But, after a hard working day, you and me most probably would not be so enthusiast to dissipate any further physical and psychological energies in interacting, responding, participating, modifying, sharing. Maybe we would prefer to be told a story, to receive it passively, for instance we would prefer watching a movie, a theatre play or a TV program. Moreover, interacting does not necessarily mean getting what we want…: we very often find the information we are interested in not where we are searching for it or where we are expecting it is, but casually, we meet it by chance: this is called the serendipity effect. Hence, respect for the user. 3) The third input is about the software and the privacy, but involves the social dimension. I think it is important that the software layers and the hardware are open, but this is only a part of the problem. Who manages the layers interoperability and who creates the norms that rules the layers? Again the introduction note that we received states that: “IoT can be broken down into 4 layers. A value chain where all objects can be tracked, logged and traced (much like the barcode standards). A service layer will be build on this, currently mostly by the mobile operators who will be offering filtering layer deals to customers just as they do now with sms/gsm. […] On top of this layer – and currently interwoven in it through the public private partnerships – we find the smart city layer. The ultimate limit and scope of IoT is the Sensing Planet idea where all natural processes are captured by enormous globally distributed sensor grids and have a counterpart in the cloud.” Right, but, for instance, who will own and rule the city layer? Who will decide, manage and filter the information that will be accessible by the users? And how? And, reciprocally, who will manage, and how, the information about the users? These are, for privacy and security reasons, very delicate topics that are probably more important than the bare open related aspects. And, definitely, they can have a deep impact on the social dimension, on the state of the single individuals as well as on the relations among humans and among humans and their cultural – both natural and artificial – environment.